Our collections of 3D plants and trees are made by ArchiRADAR, who guarantees its quality. They are specifically designed to be beautiful, once placed in the projects, but also very light. 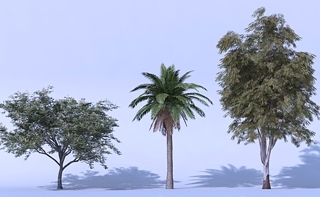 This way you can place a lot of trees without overloading the project management or the rendering calculation. The Download is IMMEDIATE after the bought !! If you do not receive the email with the link to download the objects, please check your SPAM folder. I'm a real fan, I think your trees look & work amazing. I have two volumes of your trees, Set 3, Set 6 & close is your free Birch tree. Your objects are great and I like the new 2D for the floor plan. Great products, thank you as it fills a real void. Utilizziamo regolarmente i vostri alberi per i nostri progetti e ne siamo entusiasti! Specialmente nei rendering aggiungono un tocco di realismo alla scena che non riuscivamo a dare con le librerie standard del programma. Abbiamo sempre avuto la necessità di trovare librerie di vegetazione per Archicad e finalmente adesso esistono. Grazie a tutto lo staff! Great products and great support, we love really your trees. Modeling realistic context for western North America has been a challenge as most catalogs have only deciduous and tropical tree species. We hope you offer these options and if not that you will consider developing them in the future. 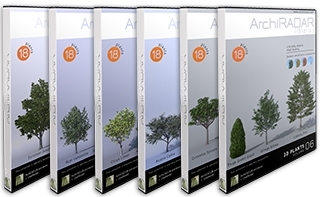 I just bought Volume 1 of ArchiCad Trees. I couldn't imagine that we can have this quality in archicad, very good job. Keep doing this. I'll buy more, and definitely I will recommend your work. The Archiradar trees were on display at the RTC/Archicon this year in one of the presentations and I must say it is a really great library. Just got Volume 09 and have been testing it in terms of render times, BIMx render modes etc and it is just phenomenal. Very high quality set of trees that will enhance our project's presentations. I had the privilege to look at a small amount of the Archiradar trees through a friend and I can tell you that the logic (code) behind the generation of the trees geometry is impeccable. I can't think of a better method. Well done!